In some ways I think I had the reverse experience of this. There were many toys I had with little missiles or other small projectiles that were glued in place on the space ship or robot. I was amazed when I grew up and saw that they started making functional missile launching toys again. I wonder if there is an interesting story behind that. 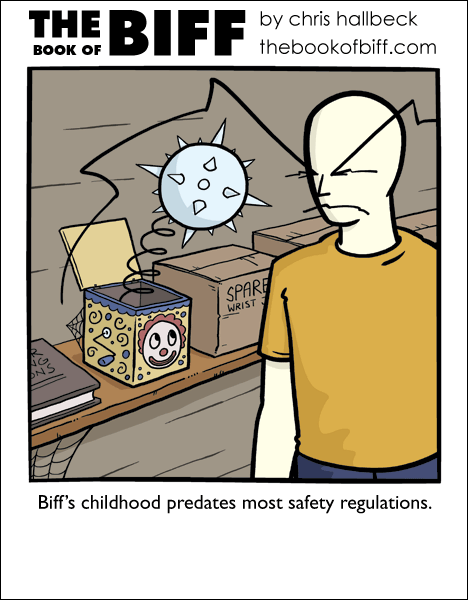 This explains a lot of Biff’s invincibility: Nature provided him with a survival mechanism. just this last weekend, i was feling really nostalgic for my lawn darts. Ahh, the toys of youth. One that sticks out most is one my brother had, it was a plastic molding mini-factory you could make you own toys with. The fumes were incredible. One I had was a metal moon rover with a huge metal lunar landscape that made the so much noise you could wake the neighbors, in the next county. Oddly enough it suddenly disappeared never to be seen again. The story? Well, they started gluing the darts in place when, apparently, some child somewhere choked on a “Battlestar Galactica” toy missle. Immediately thereafter, they either glued them all in place, or were SUCH big, clunky things that the wimpy little springs in them couldn’t propel them as much as 5 feet. Needless to say, they were so large that you couldn’t conceive of swallowing them. I miss those BattleStar Galactica toys–despite most of them having NO relationship to the old show, they were kind of neat. I still remember feeling gypped when my Micronauts missles (the next toy craze) were non-functional. OH SWEET LORD, I see why they traded that for the scary clown face…..
LOL, Mace-in-the-box, the “Try And Put The Pin Back In” grenade game, the Little Doctor Bonesaw, I bet Biff has all the real classics! I wonder if his eyebrows got caught in the pedal, and then went it went backwards to release the mace his eyebrows becake biff. Okay Biff needs an eyebrow-cut. He could lose an eyebrow on that thing. Hah! Be envious of me! When I got my GI Joe recoilless rifle on a jeep, that sucker could launch missiles that would choke a ten year old, and send them 20 feet or more. You actually *could* put an eye out with that thing, if you were sufficiently persistent and/or unlucky! Of course, in my day, it was the original GI Joe, about 13 inches tall, and fully equipped with dangerous accessories. If things keep going this way I am wondering what it will be like in another generation. Lol on the Red Dwarf reference! My story of safety regulations didn’t happen in the nursery, but rather in the kitchen. My father handed me a knife when I was really little. My mother freaked out “She’s gonna cut herself”(I am a girl). But I knew how to handle a knife without really trying. I’m thoroughly convinced Biff’s parents were trying to kill him.